I can make planters in hypertufa, but I can also make a lot of other cute things. Remember for Halloween, I made those cute pumpkins to set around for the fall holidays? Those could be used at Halloween and turned around to use at Thanksgiving too! But now I am getting into a Hypertufa Snowman. And these are so cute you will fall in love. Easy and quick to make too! If you have a drawer full of old pantyhose or knee highs, these are golden! The packed hypertufa goes into the sock and as you add more and more it gets rounder and rounder. Shape it up and…Voila! A gray hypertufa snowman, no leaching needed! 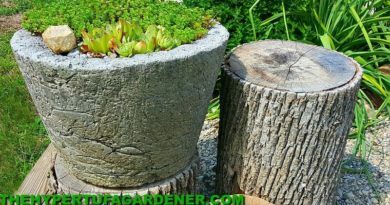 All you need for these is a mixture of hypertufa. I did not plan these as a planter. 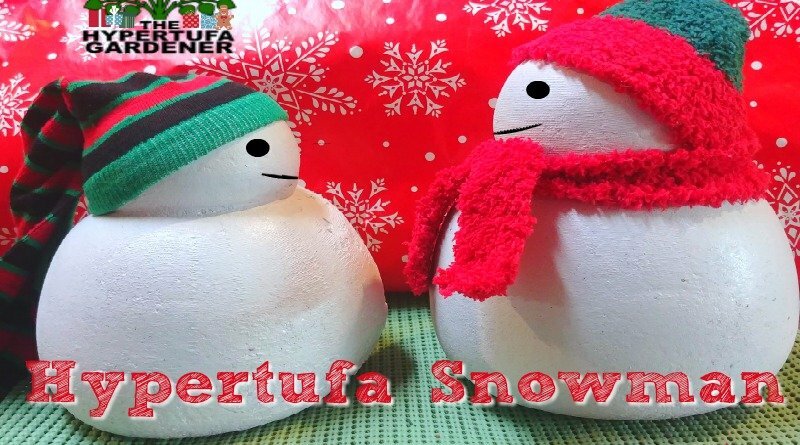 My idea was just for decorations through the winter months when snow is outside and a little Hypetufa Snowman would bring a smile to your face. 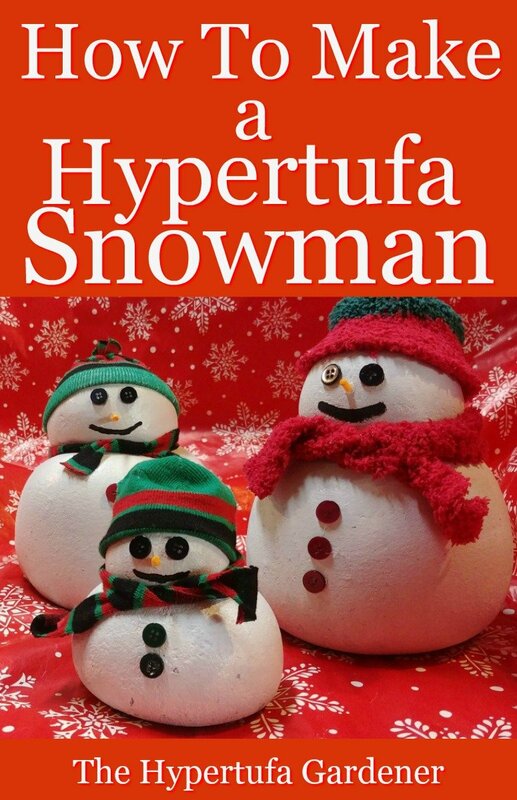 Maybe even a whole Hypertufa Snowman family. So I have altered the recipe just slightly but you could use whatever recipe you would like. Experiment and see what gives you the “look” you want. Once you’ve made one, it is so easy that you will want to make dozens! Note to self: Maintain control! I used 1 part Portland cement, 1/2 part vermiculite, 1/2 part sifted peat moss ( or coir, shredded paper, soil, etc) . To make it even easier to remember, just look at it like this, 2:1:1 ratio. 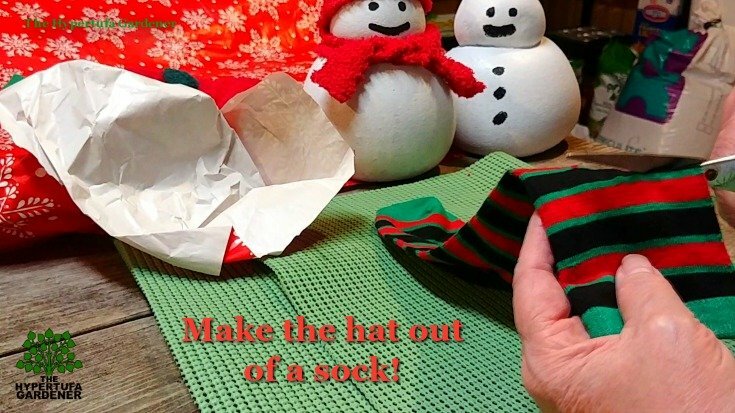 Old sock matching the size of your hypertufa snowman, kid sock for little ones or adult sock for larger ones. Watch this quick video on how to make the project. It is simple and easy and should be ready to paint after drying on the 2nd day. I am not leaching this hypertufa snowman since mine is not meant to be a planter. And I am only curing it for a day or two to set the cement. My hypertufa snowmen will remain inside or on a sheltered porch for decoration. You may decide on an outside decoration, and if so, let it cure for 5 days inside a wrap of plastic. As you see in the video, just stuff the section of pantyhose full of the hypertufa mixture. I found it easier to stretch the knee high over a pot so that the opening is held for you. Using the bottom portion, fit the toe seam on your bottom center or if you have cut a section, just put the tie knot approximately in the middle. These pantyhose stretch really far! You just need enough to tie them off when full. The knot will be cut off later. It’s runny and messy, messier worse if your mixture is too wet, so strive for the drier mix. Once the hypertufa snowman is dry (overnight), then cut the rubber band and cut off the knots, and peel away the pantyhose. It’s dusty so be sure to wear your mask. Then brush and clean him up and you are ready to paint. I made mine white. Either paint on some eyes , nose, mouth, buttons. Or use glued-on eyes and real buttons to decorate him. Get creative! I made a trip to the Thrift Store earlier (as you can see in the video) and looked through the sock section. They were very cheap, so I just chose colors that appealed to me. I think when I make more, I may get a blue one, then pink etc so that I can do a fully pink SnowLady. But the Christmas patterns you can find really stand out when you dress the hypertufa snowman. Use your imagination and I am sure you can come up with anything. Tiny wigs? Tiny brooms? This should be something to make that can have so many improvisations. No limit to what can be done. 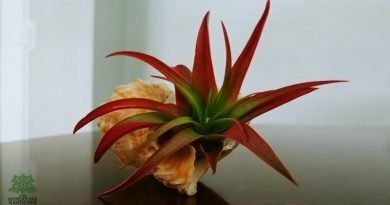 Be sure to come over to the Facebook Group Page and post your projects. We would all love some inspiration there. 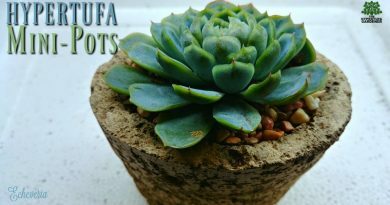 Maybe you can make some for a fundraiser or even your Hypertufa Shops some of you sell through. Wish I had your energy…and stamina! ← Unpack Those Christmas Decorations! It’s Time!